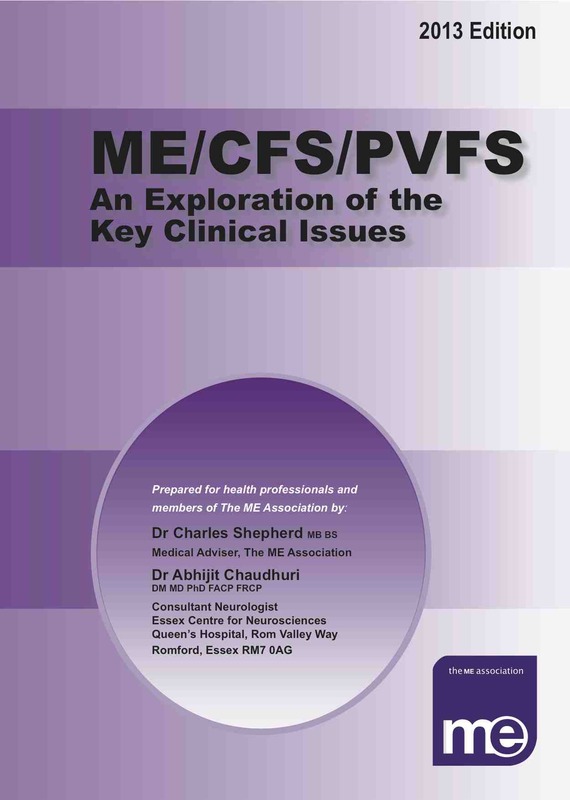 The latest edition of the ME Association’s ‘Purple Booklet’ has been flying off the shelf since it came out in the middle of 2013 – with over 7,000 copies being sent out. It’s available, price £6, only from our office at Buckingham, tel: 01280 818 968. Of the thousands of copies sent out so far, the vast majority have been posted free to GPs, consultants, other healthcare practitioners and medical libraries in all parts of the UK – thanks to two successful Christmas appeals that paid for the printing and postage. And we’re delighted to be able to still offer this particular facility. The full title of the booklet is ‘ME/CFS/PVFS: An Exploration of the Key Clinical Issues’. It is written and regularly updated by Dr Charles Shepherd, medical adviser to the ME Association, and Dr Abhijit Chaudhuri, consultant neurologist at the Essex Neurosciences Centre, Queen’s Hospital, Romford. An edition, prepared only for circulation in New Zealand, is available from ANZMES, the Associated New Zealand ME Society. Can the purple book be ordered online? Not yet, I’m afraid. We’re waiting for our online shop to be launched. Please purchase it by phoning 01280 818 968 (weekdays only) and using a Debit or Credit Card. Thank you for pointing out the faulty link – I’ll fix it now. The search facility is not working properly. Instead of the search symbol (magnifier) a cross (X) appears which, when you click it, clears the text. I also tried to use the online shop to pay membership fees but see that it is not properly running at the moment. Will do this by another means. I appreciate the the ME Association cannot change the attitudes of biased and prejudicial GPs or other health professionals toward patients with this illness or symptoms meeting the ICC or CCC criteria. I have had one very bad result from attempting to provide a doctor with information about current research, including only reputable websites such as this one. She had a meeting with the other partners in the surgery and wrote me a letter telling me that they all agreed it might be best if I found another surgery. Being almost totally bed bound made that nearly impossible. My part time carer and I phoned 9 surgeries whose catchment area I am in and whose websites stated that they were accepting new patients. As soon as she identified herself as my carer, they all told her they could not accept me as they are unable to provide home visits or nurse visits. A tenth practice did accept me, but only on the condition that I would always come into the surgery. This involves a wheelchair taxi being hired at significant expense, and a carer to accompany me. I have found there is really no way to get what I need from the NHS doctors in my area. As a person who has been diagnosed with Fibromyalgia, but has symptoms which meet ICC or CCC criteria, I have not had any doctor with an open mind about assessment for ME, and my local consultant is of the biopsychosocial school, prescribing CBT and GET. I have not had any opportunity to be assessed for ME, and I am just getting lectured by GPs about being more active, or else had them prescribe CBT and/or antidepressants. I am far from depressed. I am mostly bed bound after having pushed myself as much as I could for years, yo-yoing up and down constantly. Since I have a Fibromyalgia diagnosis, no doctor even wanted to use the word ME and certainly did not want to discuss it. Followup to my previous comment: Have the ME Association received positive feedback to conclude that sending out this booklet actually results in GPs READING it or taking this condition seriously as a bio-medical illness? I have not even found that my doctor was willing to look at the NICE guidelines about Orthostatic Intolerance and instead ordered useless tests which wasted NHS money. After significant research on my part, I got another GP to refer me to a specialist in POTS and was diagnosed with it. With regard to Fibromyalgia and ME, I have got an immediate negative response or just changing the subject, with all the medical professionals I have seen. I certainly do hope that SOME of those who receive this booklet take the time to read it.